UNHCR, the UN Refugee Agency, has praised the rescue of around 1,500 people by the Italian Coast Guard in coordination with Frontex, the European Border and Coastguard Agency, from boats struggling in rough weather on the Mediterranean over the past days. In the wake of one known shipwreck of an over-crowded and flimsy vessel off the coast of Libya, at least eight bodies have been recovered by European authorities. According to the Italian Coast Guard, a French ship working under the Frontex operation sighted and rescued four people in high seas on Saturday 30–40 miles (48–64 kilometres) from Libyan shores. Early reports from survivors say at least 100 people were aboard a dinghy that collapsed some 30–40 miles from the Libyan coast, between Tripoli and Misurata. During the night of January 14th, the Italian Coastguard rescued another 34 people close to oil platforms around 55 miles (88 kilometres) from the Libyan coast. Italian authorities also report that three survivors from another rescue operation have since died from hypothermia, while another two had suffocated aboard the boat. 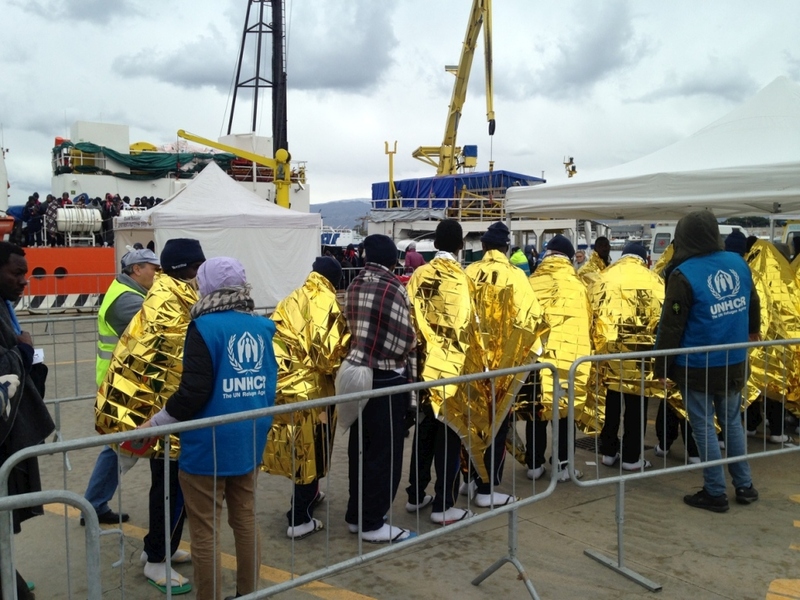 Survivors and victims from the recent rescue efforts were disembarked in Lampedusa on Saturday and on Sunday in the port city of Messina, on the northeast coast of Sicily. UNHCR staff assisted during the operations and with the commemoration of the victims. Last year was the deadliest year on record on the Mediterranean Sea with more than 5,000 deaths recorded. This compares to the 3,771 recorded in 2015. This lethal start to 2017 highlights the urgent need for States to increase pathways for the admission of refugees, such as resettlement, private sponsorship, and family reunification, so they do not have to resort to dangerous journeys and the use of people smugglers.